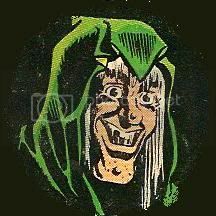 The Lucky 13 is back at you for week number three--an unflinching journey into the occult! That's right, we're turning our attention to horror's satanic manifestations this time around, and choosing our favorite flicks pertaining to all things demonic. As always, this little undertaking is happening in conjunction with Brutal as Hell, and what's interesting this week is that all three selections here mirror selections made by members of the BAH crew--apparently there's a bit more agreement around here than usual, perish the thought! Suspiria is Argento at the very height of his powers. It's definitely the closest he comes to being the Italian Alfred Hitchcock, which I've always felt was his goal. The levels of genuine suspense, the ebb and flow of tension that he is able to create here is truly staggering. It really is all about the sensory feast Argento and his crew have cooked up for us. Luciano Tovoli offers up some truly sumptuous cinematography that epitomizes Argento's philosophy that horror can actually be beautiful. The lighting is intriguing throughout, with some truly breathtaking use of color--red being the theme, of course. This is a rich, textured film, and I find I take away something new from it every time I watch it. I enjoyed it from the very first time I saw it, about 12 years ago, but I don't think I fully appreciated it until I started re-watching it. There's just so much being thrown at you, that I think first-time viewers can be a bit overwhelmed by it all. But this film is like a fine wine that ages wonderfully, and provides greater and greater pleasure over time. It's also a perfect example of technique over content. It's a true filmmaker's film. While the script and acting are all adequate, that's not what keeps me coming back to this film over and over. Rather, it's Argento's enthralling style, the deft manner in which he crafted this gorgeous, gorgeous film. 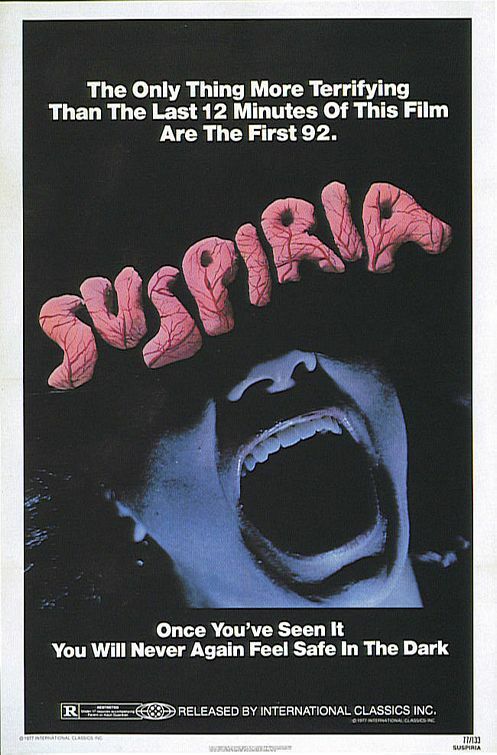 In addition to being a filmmaker's film, Suspiria is also a horror fanatic's horror film. It might not be the best to show someone who's only a casual fright flick fan, but for those more discriminating lovers of the cinematic macabre, Suspiria remains a titan of the genre. As a horror film, it is all but perfect. 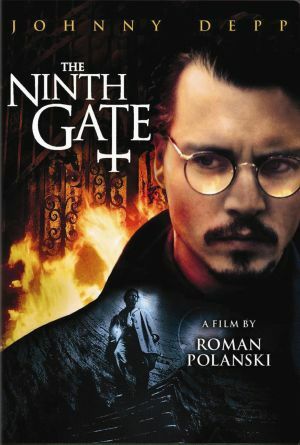 The Ninth Gate is a film, in my opinion, that seemed to have gone under the horror radar back in 1999. I hardly ever bump into any genre fan who admits that they like it or have even seen it. This upsets me a bit. In a way I can understand; it is helmed by the same director who gave us Rosemary’s Baby, another more popular take on Satan’s rising. The Ninth Gate is a really fantastic film in its own right, though. It is cloaked in a palpable sense of mystery and foreboding that effects me every time I watch it. Roman Polanski’s mastery behind the camera creates one of the most engaging and disorienting pieces of cinema dealing with Evil incarnate. Book detective Dean Corso (Johnny Depp) has been hired by the brooding Boris Balkan (Frank Langella) to authenticate his copy of The Nine Gates of the Kingdom of Shadows, a forbidden tome that is reputed to conjure up Lucifer himself. Corso must travel across the globe to compare Balkan’s volume with the only other two in existence. But as he investigates further into the cryptic engravings that adorn the book, Corso finds himself being followed not only by a mysterious Girl (Emmanuelle Seigner) but also a cult of devil worshipers and a killer who is intent on claiming the engravings to bring about the Dark Lord’s arrival. Although erroneously marketed as an action-packed film in the vein of End of Days, The Ninth Gate very well could have been made in the '40s as one of Val Lewton’s psychological shockers. The film exposes the monsters present in the human soul while taking place in a world populated by looming shadows and the glowing eyes of watchers unseen. There are little visual nuances and clues that adorn the proceedings, much like the pictures of the diabolical book’s pages. One of the enjoyable aspects of this movie is noticing things that have gone unseen in previous viewings. People are seen out of the corner of the eye, occult images are hidden in the background, and the overwhelming sense of ominous events to come never leaves. It’s a film that gets under your skin and makes you feel uneasy in the best possible way. We can’t help but feel that the Devil is center stage the entire time, slinking in the shadows of a hallway or heard between the whispers of a book’s turning pages. 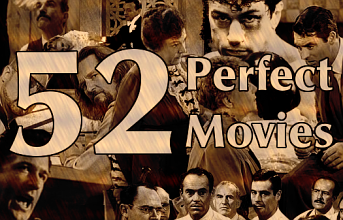 The performances only enhance the atmosphere of the film. Corso is reminiscent of the antiquarian heroes of Lovecraft’s stories, albeit a more cynical, greedy and self-absorbed variant of H. P.’s protagonists. Langella simply oozes presence as the film’s main villain, and his deep voice is enough to make you realize that this guy is serious when he’s speaking. Rounding out the leading players, Seigner is both mysterious and infuriating as the girl Corso calls Green Eyes. The writing and Seigner’s elusive performance combine to confuse the viewer, constantly making you unsure of her motives and perplexed as to her unexplained protection of Corso. The Ninth Gate is a fascinating puzzle, one that may leave the viewer with more questions than answers. Figuring everything out is half the fun. The question is, though: are you brave enough? Dare you seek the Devil out? 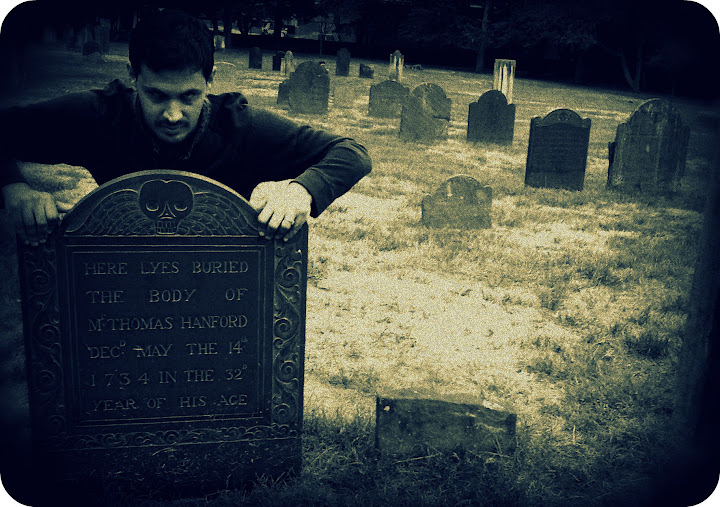 The film is a descent into darkness, an exhilarating journey where your very soul may be on the line. I think it’s worth the trip. Before I'm through, I'll probably have cited several John Carpenter flicks as my favorites. He is head and shoulders above the rest as my favorite director, and Escape From New York tops the list of my favorite movies. Carpenter started to slip after Big Trouble In Little China, but before the decade was up, he would kick out a couple more sweet flicks before everything went black: They Live and Prince of freakin' Darkness. 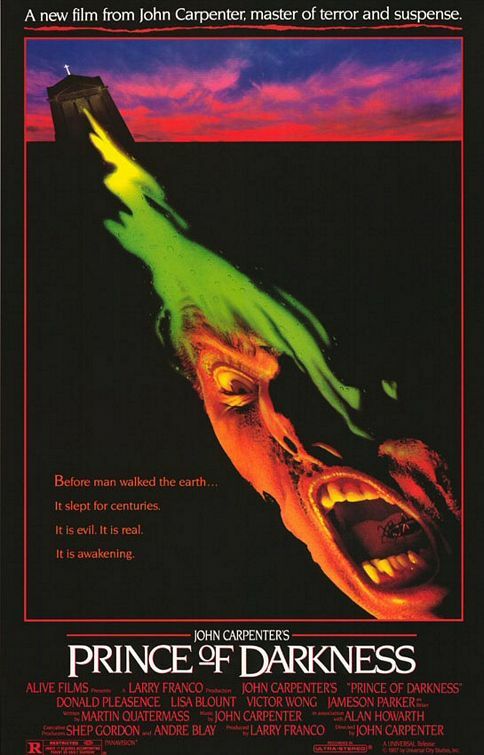 A scientific research team is summoned by the clergy of a burned-out old Los Angeles church to investigate the church's dark secret, a vat containing a constantly swirling liquid which is said to be the physical manifestation of Satan. The team finds out the hard way that it is, indeed the devil, but rather than being a malevolent personality in the form of beast or man, Satan is a primal force whose energy and matter has a corrupting influence over everyone around it. Its ultimate goal, however, is to bring an even bigger, more powerful and evil force trapped in another dimension into ours. I'll be straight with you. Prince of Darkness doesn't make a lot of sense, but it has a lot of great ideas that play nicely together. It stars a couple of Carpenter favorites, Victor Wong and Donald Pleasance, and graces us with a cameo from horror rocker supreme, Alice Cooper. The movie is also creepy as all get-out. It marked a strange period for Carpenter when he was given especially small budgets to make movies, but with those budgets came complete creative control. What you got was hare-brained goodness, and a love letter from Carpenter to another demonic favorite of mine, Quatermass and the Pit (aka 5 Million Years To Earth). The plots, though taking place in different settings and under different circumstances have a lot in common, namely the wicked discovery of an ancient, lost artifact that exhibits a corrupting influence upon everyone who comes into contact with it and the only thing capable of stopping it is SCIENCE! The script, by Carpenter, is actually credited to one of his many name-dropping pen names, in this case, Martin Quatermass. The researchers also hail from Kneale University, so-named for the writer of the Quatermass series, Nigel Kneale, who also wrote Halloween III. Join us next week, when it'll be all about the red stuff. That's right, time for gore movies! This is wild. First time we had some total overlap on titles. Nice to see there is shared common favorites. I'm also glad to have found the other fan of The Ninth Gate. We should start a fan club together. Haha. Thank you for not only mentioning the Ninth Gate, but also for recognizing its significance as a piece of horror filmmaking, and I would also argue, as a contribution to the satanic and "occultic" cinema subgenres. Perhaps with more positive mentions of the film it will find its audience. Ah, Suspiria. What a choice. 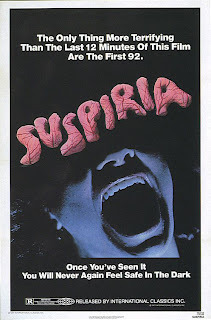 I often feel that people outside our little community just don't *get* Suspiria. And I think you've hit the nail on the head. It requires multiple viewings to really learn to appreciate it. It's so dense, so much is happening. It's just incredible. As for The Ninth Gate, it sort passed me by, but if y'all are recommending it, I'll definitely seek it out--especially now I know it's a Polanski effort. And Prince of Darkness... well, of course. I'll be honest, the first time I saw it, maybe ten years ago, I just didn't know quite what to make of it. It really did take a while to sink in. Same goes for the westerns of Sergio Leone, and even Fulci. I think it's just something about the style of those Italian filmmakers, I don't know, but once it sinks in, it holds on for dear life. I don't feel the same about Fulci--or even other Argentos (well, some of them, I suppose). Fulci, to me, is this man that makes absolutely senseless films, but they are so damn pretty that I still get pulled right in. They have some genuine scares, but if you're looking for a film that stands up to scrutiny, he's not the dude. You dig? Sergio Leone is someone I don't know enough about to really comment. Get back to me when I am more well-versed. Dead on about Fulci--doesn't make sense, but you can't stop watching it. Funny thing about Leone. At the risk of sounding sexist, my observation has been that men are far less reluctant to give him a try than women--the whole "cowboy thing" is ingrained in their little boy psyches, I think. But that said, it is so well worth it. I nailed my sister to a chair and got her to watch The Good, The Bad & The Ugly and she LOVED it. Also, I recommend Once Upon a Time in the West. It's not sexist at all. You essentially cite the social construction of gender for creating this situation, which might be completely accurate and would definitely be something all my women's studies professor would agree with. I used to watch Westerns with my grandpa, but since he passed 11 years ago, I just haven't watched any--even Rooster Cogburn or The Searchers, which I love. I don't know. It just doesn't feel the same. But I'll queue one up and give it a shot. Though, with 400 movies in my queue, it may take me a while. TRAILER TRASH: Swamp Creature Edition! The Lucky 13: Week Four: Gore!